KYIV, Ukraine — Rigid, traditional views of gender roles in society and stereotypical ideas about masculinity and femininity are common among men in Ukraine, contributing to gender-based violence, unequal treatment for women, and poor mental and physical health outcomes for women and for men themselves, according to a ground-breaking survey initiated by UNFPA. The majority of the 1,520 men interviewed as part of the nationwide survey, the first-ever comprehensive study of men’s attitudes towards gender-equality issues in Ukraine, agreed that it is a man’s job to be a breadwinner, while a woman should take care of the home and children. Men’s responses also indicated, however, that they feel constricted by what researchers characterized as a “man box,” a set of attributes that men are taught from early childhood to fit into. Men feel they are not allowed to show weakness, to ask for help, or to confess that they do not know how to solve a problem. 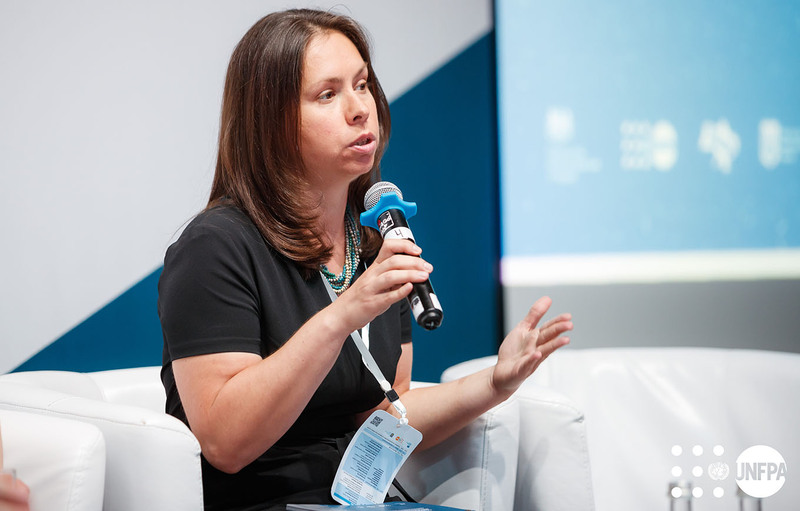 “Aggression and power are seen as essential qualities for men, but this perception comes with a high price,” said Roman Greba, Ukraine’s Deputy Minister of Education and Science. The ministry has commissioned a group of experts to review school textbooks for out-dated references to gender roles as well as other types of discriminatory language. Inability to play the role imposed on them by society can provoke a “masculinity crisis” among men — and can trigger domestic violence as a man seeks to remind himself who is the master of the house. Two-thirds of respondents to the UNFPA survey said they believe that a man should have the final word about household decisions, and more than half agreed that they have the right to know where their partner is at any moment in time. “Many women themselves often doubt whether they have a right to make a certain decision, or worry about what their husband’s reaction will be,” said Maria Efrosinina, a TV presenter and UNFPA’s Honorary Ambassador in Ukraine. One in four respondents to the UNFPA survey, titled “Masculinity Today: Men’s Attitudes to Gender Stereotypes and Violence Against Women,” said they had witnessed physical violence by their father against their mother, while half said they had been physically punished by their parents as children. One in every two men said they either endured or witnessed physical bullying during their school or army years. As adults, one in three men admitted feeling stressed out by their job or working conditions. One in six said they had trouble focusing and had felt depressed during the previous month. 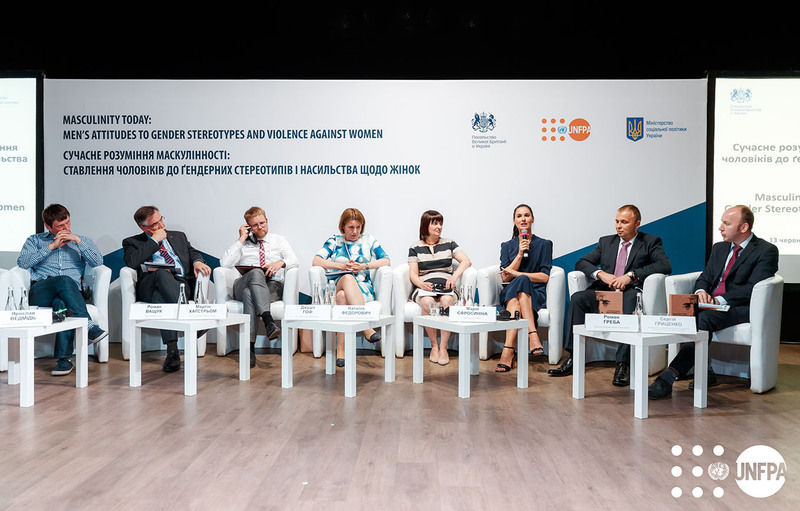 The UNFPA survey in Ukraine demonstrated a clear connection between experiencing or witnessing violence in childhood, and committing violent acts in adulthood. “We see that violence leads to more violence,” said Brian P. Heilman, senior research officer at the NGO Promundo, which works on advancing gender equality and preventing violence in over 40 countries around the world. Its global International Men and Gender Equality Survey (IMAGES) formed the basis for UNFPA Ukraine’s research. “The more masculinity is enhanced, the more aggression, stress and mental-health problems we witness,” he added. More than a million women in Ukraine are estimated to experience gender-based violence each year, though the real figure is likely even higher. A well-known Ukrainian proverb, “Don’t put garbage outside of your house,” speaks to the belief that family conflicts should stay private, and indeed only 30 per cent of survivors of gender-based violence seek help from social services or police. Fear of stigma or further violence keeps many women from seeking help, as does a lack of knowledge about where to find assistance. Reporting of violence is also discouraged by the fact that six out of 10 women in Ukraine are dependent on a male breadwinner. Additionally, many survivors do not consider emotional abuse, such as intimidation, insults, control and humiliation — actions which 13 per cent of interviewed men reported using against their partners during the past year — as a type of violence. Ukrainian law criminalizes domestic violence, but only one in three respondents indicated that they knew such legislation exists, and most believe it does not protect victims and might in fact cause additional violence. One in five men surveyed said they think the law is too harsh on abusers. Achieving a better understanding of the nature of intimate-partner abuse was one of the goals of the survey, which included interviews with 355 men who had been referred to intervention programmes for perpetrators of domestic violence. “We tried to compile a portrait of a potential perpetrator, but they all differ. What unites them, though, is discontent in their marriage and a feeling of having found themselves in a masculinity crisis,” says Hanna Herasymenko, lead researcher at the Institute for Demography and Social Studies of the National Academy of Sciences of Ukraine, which carried out the survey for UNFPA and compiled the report on its results. Though many men surveyed expressed a belief that the use of physical force was a way to “cleanse” negative emotions, a majority of perpetrators of violence reported feeling tired, depressed, or irritated after family conflicts. The level of depression and anxiety reported among respondents shows clearly that cultural stigma against men discussing their feelings takes a toll on them as well as their families. But men are also reluctant to reach out for help. Eight out of 10 respondents to the UNFPA survey said they had never visited a psychologist; most men said they found such specialists untrustworthy in comparison to the advice of their parents and other relatives. Violence in the family is not the only way that gender inequality manifests itself in Ukraine, which ranked 61st among 144 countries in the Global Gender Gap Report 2017, published by the World Economic Forum. The division of responsibilities within families is heavily gendered, with women spending an average of 49 hours per week with their children, while men spend only 22 hours. Very few men take parental leave — or even know that it is available to fathers as well as mothers. Sixty-three per cent of men surveyed by UNFPA said childcare, including changing diapers or clothing and giving a child a bath, is exclusively a “women’s job”; one-third of participants said men do not know how to take care of babies at all. The only exception was talking and playing with children, an activity in which men and women are equally engaged. These perceptions carry into the workplace as well. While there was general agreement that women and men should receive equal pay for equal work, seven out of 10 Ukrainian men surveyed by UNFPA agreed that a woman’s most important role is taking care of the home and cooking for her family. And 82 per cent of men agreed that there is a division between “female” and “male” professions in Ukraine. Four out of 10 believe that entrepreneurship, for example, is a “male” occupation. Accordingly, only 30 per cent of top managers in Ukraine are female, while only 12 per cent of deputies in the Ukrainian Parliament since the country’s independence have been women. But young men are also more likely to feel that their self-worth is diminished if they earn less than their wives. Such deep-seated perceptions need to be challenged from an early age in schools, in the media and by ordinary Ukrainians themselves on social media so that gender equality is seen as desirable — and as beneficial to both men and women. A version of this story was originally published by UNFPA Ukraine.